Indian cellular carrier Spice Telecom is placing its bets on a phone that will use an optical disc drive in order to play movies. It's the first such device of its kind, combining next-generation miniaturized storage with Bollywood star power. At the Mobile World Congress in Barcelona this week, Boulder, Colorado-based Vmedia Research is showing off what is likely the world's first cellular handset with a blue laser optical disc drive. It'll make its premiere in India as the "Movie Phone" from Spice Telecom. The device has a 2.8-inch screen, which is viewed landscape-style when in movie mode. TV-out functionality is supported, allowing users to play back content at 576p on their televisions. 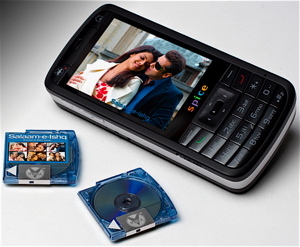 Movie discs are inserted through a pop-out tray on the back side of the phone. 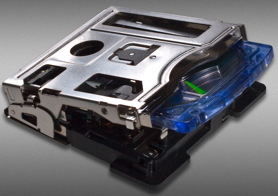 Each single-layer disc is 32 mm in diameter and mounted in a molded plastic cartridge, similar in nature to Sony's PSP UMDs. 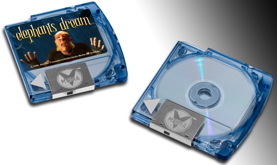 The first generation of these discs have a capacity of 1 GB, enough to hold a feature-length film plus extras, using the company's proprietary H.264-derivative video codec with AAC audio. Each disc is said to hold about 2.5 hours of video content, depending on the compression used. Vmedia expects subsequent generations of its device to be completed by 2009, one of which may enable dual layer discs with double the storage space. Launching a new format is always tricky. Sony found this out during its push for UMD movies on its PlayStation Portable. Even with a considerable amount of support from studios, and the PSP's own success, UMD never managed to catch on among consumers. Even Netflix -- a company whose success was built upon the disc trade -- has given the optical format a five year shelf life at best. But Vmedia is looking to test the viability of its 9.5mm Panasonic-made optical drives during the second half of this year in hopes of future adoption in the portable sector. India's Spice Telecom will be the first outlet for consumers to get their hands on Vmedia's product, offering 40 films at launch and expecting more than 1,000 to come later through studio deals. The majority of the films will be of regional interest, such as Hindi comedy hit Dhamaal. Vmedia's device is the product of several partnerships: the aforementioned miniature optical drive comes from Panasonic Communications, the discs come from Cinram International, the handset is provided by Shanghai design firm Longcheer Technology, and the Vmedia software comes from PacketVideo. Each disc will sell for the US equivalent of $5 when the device first ships in India in June. It is not yet known if the Movie Phone has been adopted by carriers in other markets.